Few months back, their love story was all over the showbiz industry and the media also was awash with the news. This is because a lot of people taught this was it for Island Big Girl, Toke Makinwa after she got engaged to Eden lifestyle Health Fitness Boss, Maje Ayida on Thursday 12th April 2012 after 9 solid years of courtship. The lovebirds were so close that no one could come between them. Maje and Toke met 9 years ago at a party through Sola Ojora and became friends. She was a student then at University of Lagos while he was a young man trying to start a new life after school and since then they have been an item, not until news started flying lately that Toke and Maje were no longer together. 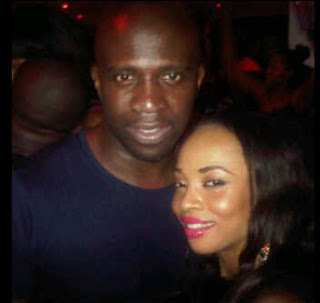 Information made available to us revealed that Toke’s marriage plans to Maje has hit the rocks. Close friends to the erstwhile lovers are pointing accusing fingers at Toke’s high profile lifestyle. This, we gathered, has stalled their preparations for their proposed wedding said to have been fixed for December, 2012. Details of the hiccups are yet to be ascertained but an industry source revealed to us that Maje become tired of Toke’s high profile, party going lifestyle which sees her hanging around many celebrity men and Business Moguls. We gathered that Maje’s attempt to curtail these excesses led to the collapse of their relationship. There were also allegations that Toke and Maje were both unfaithful to each other while the relationship was on. Further digs revealed that Toke isn’t in the best of moods and we gathered she is making frantic efforts to win his love back as she affirms Maje as the man she wants to spend the rest of her life with. Maje,who is the son of onetime Secretary to the Government of the Federation and Super Perm Sec Allison Ayida,we learnt, has moved on with his life and presently savouring a juicy romance with another lady who we learnt is beautiful and classy. Toke is an on-air personality with high number followers on her show, Early Morning Drive on Rhythm 93.7 FM. She is also a TV personality and one of the presenters of 3 Live chicks.